This is one of those transformations that your jaw drops to the ground. 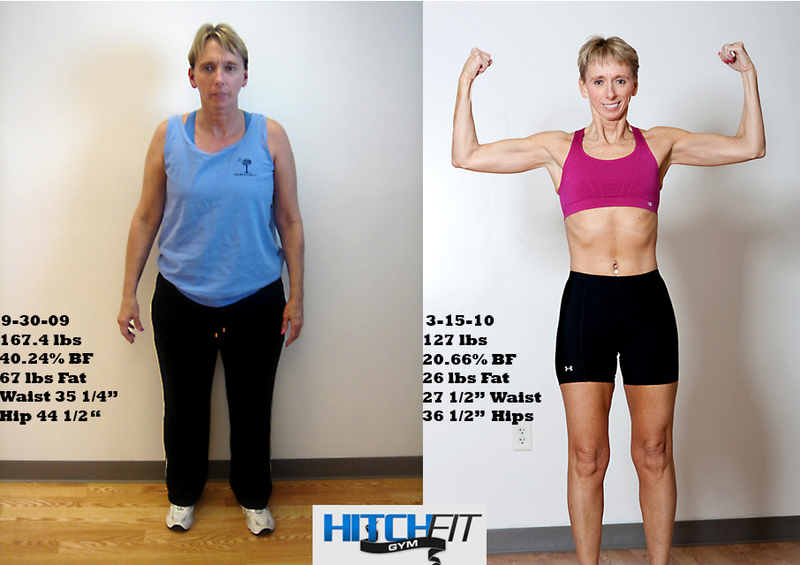 Mary is a 50 year old that started at 167.4 lbs, 40% bodyfat and arthritis in both knees. She didnt let any of these factors hold her back from reaching her Amazing transformation. In the 8 years I have trained this rates up with the best. She lost 41 lbs of fat, 20% bodyfat, 7 3/4 ” around her waist and 8 ” around her hips. She nows weighs in at 127lbs at 20.66% bodyfat. This puts her in the top category in her age group. Mary is also going to be competing in a upcoming triathelon. People I cannot explain in words how emotional I get with this one. She did everything I asked, ate perfect throughout the holidays which is very difficult. She never made an excuse, she set a goal and got there. I am so proud of her. Please take the time to watch her video and read her testimonial. If she can do this so can you!!! Last September, about one month shy of my 50th birthday, I saw pictures of a former student of mine, Brent P. who had just completed a 12 week transformation at HitchFit. I was totally amazed and impressed by what I saw and decided to contact Brent to ask him a few questions. He gave me contact information for Micah and so I sent him an email to let him know that I was interested in getting back into shape and was hoping that his program could help me out. Micah sent me a return email the very same day. I was already impressed by his professionalism. We set up a schedule for me to work with him 3 days per week. On that initial visit he took my body fat percents and we discussed my goals. When he told me that my overall body fat was a little over 40%, I remember how crushed I felt. Being a health education teacher, I knew that anything over 30% is considered to be obese. OBESE – not me! NOT someone who was an athlete in both high school and college and who has been very active as a volleyball coach for 25 years. The reality of it all hit me like a ton of bricks. From that moment, I had the incentive I needed to make major changes in my life. The decision to make these life changes was definitely a huge one. I’ve always been a competitor, always loved a challenge and I saw this as my biggest challenge in life to date. When Micah gave me my diet plan and told me how important it was to stick with it, my first thought was, Oh wow, how will I ever be able to just eat that? But, the diet was one of the easiest parts of the transformation for me. Micah reinforced me every two weeks when he took my measurements. He said a large part of my progress was due to me sticking to the diet so well. I stuck to that diet like a bee on honey and never “cheated”. I felt if I did cheat, not only would I be letting myself down, but Micah, too. When I began to see my numbers drop every two weeks, I knew I was on the right track. Of course there were days I would’ve rather done anything else but my cardio workouts. However, I felt that if I would’ve skipped a workout, it was just going to make the entire process take that much longer. So, I chose not to skip it and then enjoyed the feeling of accomplishment when I was finished with it. As the weeks passed, I thought my workouts with Micah might get easier. On the contrary! He continued to find new ways to challenge me and push me to my limits. He introduced me to Tabata and 2 minute push-ups which took me to new heights. With my muscles totally exhausted at the end of my hour long sessions with him, I would walk out the door with a smile on my face and a positive compliment from Micah about what a great workout I had had. I will say this, if you are not a self-disciplined person or don’t have a support system in your life such as a husband/boyfriend or wife/girlfriend, friends or family, then you may have trouble sticking with this program on your own. Micah will be a terrific support system when you’re working with him, but when you leave the gym, you need to have this in place on the home front, as well. My husband Chad was so supportive of me, cooked for me and was totally behind for the entire 24 weeks of my transformation. What a lucky woman I am. So, no matter your age or your current level of fitness, you too, can do this. Like making any changes in your life for the better, you have to WANT to do it and then stick with it. With Micah’s constant support and wonderful training techniques, he will take you where you want and need to be. It may not be the easiest thing you’ll ever do in your life, but it will be SO worth it. I haven’t felt this great in over 30 years. Not only have I made a transformation in my physical being, the transformation I have made to my mental being is just as impressive. Thanks for giving me the opportunity to change my life, Micah. I will forever be grateful and hope that other women and men who think that it’s too late for them, will give it a try, too. 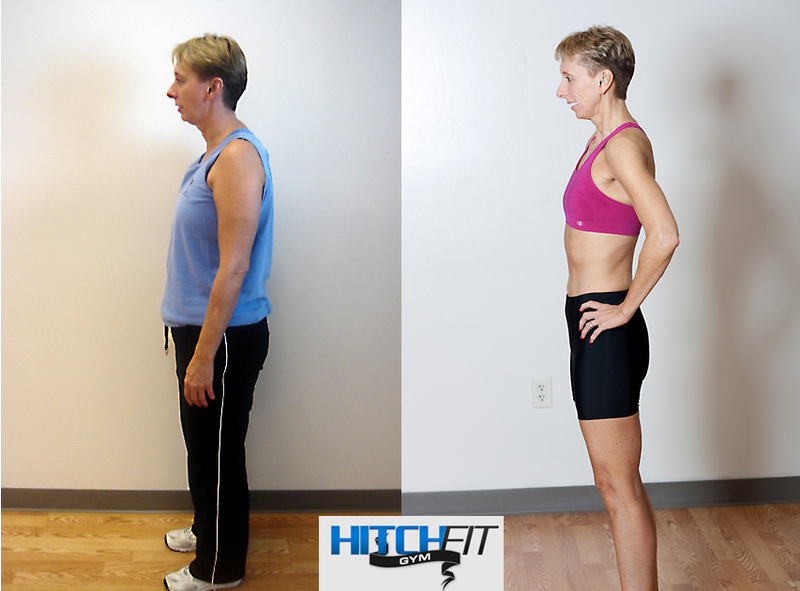 Ready to start your Hitch Fit transformation? To work with Micah visit www.HitchFit.com for Online Personal Training Program options available worldwide! I Love doing my hiit workout in the morning . It gives me energy throughout the day. If my workouts were highly intense, I feel great all day long. Supplements are not really necessary with the proper hiit routine , really good nutrition program and the proper rest. I’ve been taking creatine for over a month now. I use the product as an energy boost to give me a harder workout, making me much more fit. Anyone know whether drinking while taking the product will harm me?